November 17, 2018. 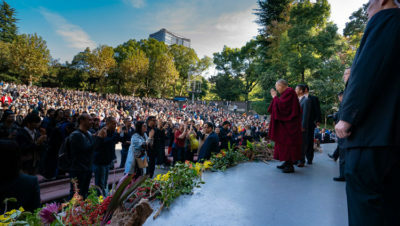 Tokyo, Japan – This morning, under bright sunshine and a high blue sky scattered with thin clouds, His Holiness the Dalai Lama left Yokohama. He drove directly to the Hibiya Open-Air Concert Hall in Tokyo, a ninety year old theatre surrounded by trees. Half the 2800 strong audience sat in the sun, the other half in the shade. The event was presented as an opportunity for young Japanese to get to know His Holiness better and to hear what he has to say. Two other special guests were introduced. Actor, film director and event producer Kenji Kohashi told the audience how moved he had been by a visit to Tibet. It compelled him to visit Dharamsala and meet His Holiness. He declared that he feels he must have been a Tibetan in a previous life. Ai Tominaga started her career as a model at the age of 17 in New York and worked there for the next ten years. She returned to Tokyo and participates in activities that contribute to social welfare and convey the traditional culture of Japan. She has visited Mongolia. She told the audience how struck she had been by His Holiness’s warmth. “Brothers and sisters,” His Holiness began, “it’s a great honour for me to have the opportunity to share my views and experiences with you. Wherever I go I emphasize that all 7 billion human beings are physically, mentally and emotionally the same. Everybody wants to live a happy life free from problems. Even insects, birds and animals want to be happy. “What distinguishes us human beings is our intelligence. However, there are occasions when we use it improperly, as, for example, when we use it to design weapons. Animals like lions and tigers that live by attacking and eating other animals have sharp teeth and claws, but human beings’ nature and teeth are more like those of a deer. We use our intelligence to fulfil our desires, to which, compared to those of other animals, there seems to be no limit. “Right here and now we are sitting together in peace and pleasure, but at this very moment, in other parts of the world people are killing each other. “As I said, devising ever more lethal arms is a poor use of human intelligence and the worst are nuclear weapons. You Japanese have actually been victims of nuclear attack and know what the consequent suffering is like. I’ve been to both Hiroshima and Nagasaki. On my first visit to Hiroshima I met a woman who had been through it and survived and I saw the watch in the museum that had stopped at the instant of the explosion and was half melted by the heat. So, instead of using our intelligence to create joy, the result has sometimes been fear. “Here in the 21st century we should make an effort not to repeat the errors of the last century with its endless series of wars. Historians suggest that 200 million people died of violence during this period. It’s time to say, ‘Enough’. Let’s make the 21st a century of peace and compassion on the basis of the oneness of all 7 billion human beings alive today. “Over-emphasizing difference of nationality, religion or race culminates in feelings of ‘us’ and ‘them’—division. We must remind ourselves that at a deeper level all human beings are the same. We all want to live a happy life and to be happy is our right. Throughout the universe are sentient beings seeking peace and happiness. What distinguishes the human beings on our planet is that we can communicate with each other—we can convey a sense of the oneness of humanity. If we develop peace of mind within ourselves, I believe we can make the 21st century an era of peace. We must heed the ways of achieving inner peace. “There are no natural boundaries between human beings on this earth, we are one family. At a time of increasing natural disasters, climate change and global warming affect us all. We have to learn to live together, to work together and to share what we have together. The way we make problems for ourselves is senseless. We will achieve genuine peace in the world if we pursue demilitarization, but we need a sense of inner disarmament, a reduction of hostility and anger, to start with. “A mother gave birth to each one of us and lavished us with care and affection, but once we go to school our education system fails to nurture this sense of loving-kindness. It’s aimed instead at fulfilling material goals. We need to re-introduce to education such inner values as warm-heartedness. If we could be more warm-hearted we’d be happier as individuals, contributing to happier families and wider communities too. “Human beings are social animals. What brings us together is love and affection—anger drives us apart. Just as we employ physical hygiene to protect our health, we need emotional hygiene, the means to tackle our destructive emotions, if we are to achieve peace of mind. 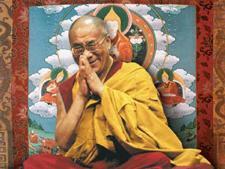 His Holiness added that when the heart is closed it leads to fear, stress and anger. Nurturing the idea of the oneness of humanity has the effect of opening the heart. When you think of all other human beings as your brothers and sisters it’s easy to communicate with them all. It makes it easier to smile, to be warm and friendly. He said this is what he tries to do. For him, whether they are beggars or leaders, all human beings are the same. If he tells himself he’s a Buddhist, a Tibetan, the Dalai Lama, it just increases his sense of isolation. He observed that Japan has historically been a Buddhist country, yet all religions convey a message of love, compassion and self-discipline. Their philosophical differences arose to suit people of different dispositions, at different times and in different places and conditions. The fundamental message of love remains the same. Buddhism, especially the Nalanda Tradition, with its emphasis on reasoned investigation, takes a realistic stance that accords with the approach of science. His Holiness recommended that to become a 21st century Buddhist, simply having faith and reciting the sutras is not enough, far more important is understanding and implementing what the Buddha taught. Ai Tominaga told His Holiness that in her experience young people today have a desire for fashion, but it’s in the context of a concern for freedom, human rights and protecting the environment. She thanked him for giving encouraging advice to the next generation. A young man who works for a NGO caring for orphans asked His Holiness to comment on leadership and optimism. “According to my observation,” His Holiness replied, “NGOs are sometimes more effective than governments agencies, so I appreciate their contribution. Since our existing culture tends to be materialistic, we look to external sources for fulfilment. But that can change. Look at how popular attitudes to war have changed. In the early 20th century if a nation declared war, people joined up proudly without question. Compare that to resistance in America to the Vietnam War or to the millions of people around the world who marched to protest against going to war with Iraq. As words of thanks were pronounced, the organizers of the event from Sherab Kyetsel Ling Institute presented bouquets of flowers to His Holiness and the other guests. A member of the audience ran to the front of the stage and offered His Holiness a knitted hat resembling a sunflower. With a look of amusement he put it on.